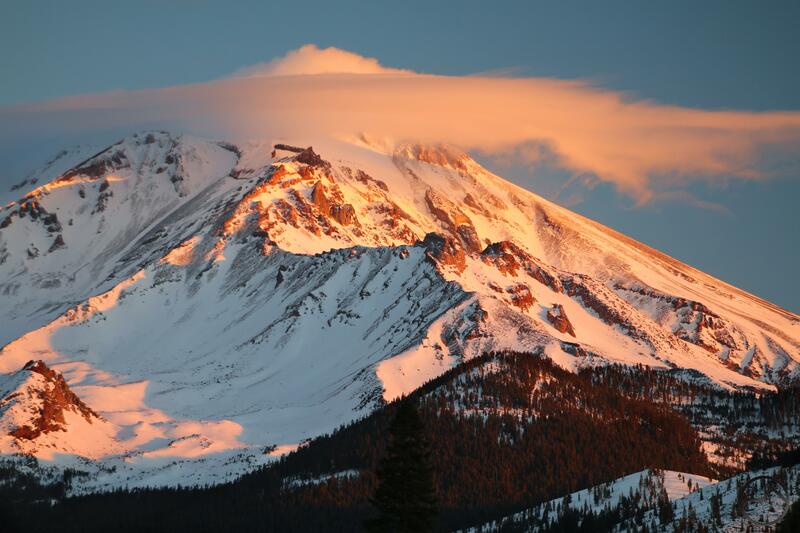 A small lenticular cloud highlights a glorious Mount Shasta sunrise. 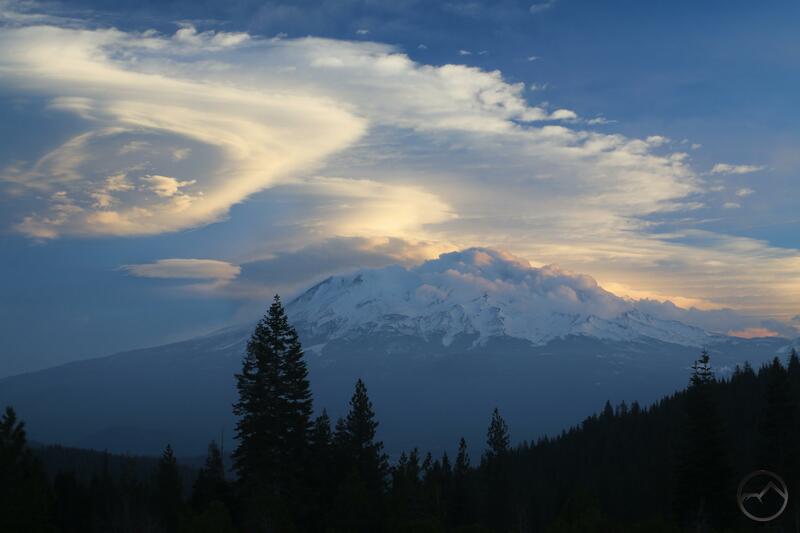 On the cusp of a big change in weather systems, Mount Shasta often manifests its fantastic lenticular clouds. This morning was no different, a small lenticular halo crowning the mountain’s summit. I popped up to a good vantage point and captured a few images as the sun came up. It was a fantastic morning. I was hopeful that the excellent sunrise would give way to an equally excellent sunset. My desire for this was made stronger by the fact that rain and snow are moving in for the better part of the next week and the chance to see the mountain would be gone for a while. My hope seemed to be rewarded as great cloud patterns continued to pass overhead all day. Continuing what is threatening to become a weekly ritual, I headed up to Bunny Flat with my two sons while my daughter was in her dance class. The conditions were beautiful, with deep snow, blue sky and far-reaching vistas. 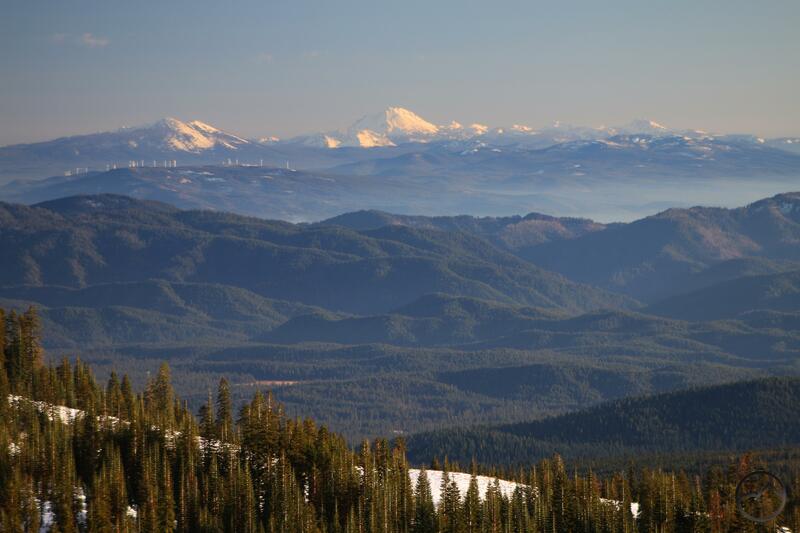 The view south toward Lassen Peak was particularly great. The whole time we were up there, the interesting clouds continued to fly over Mount Shasta. I was very optimistic of a spectacular sunset. We headed down the mountain and picked my daughter up. I then hauled the kids to an easy vista from which to document the sunset. Almost instantly the clouds departed from over Mount Shasta. While the mountain remains a tremendous sight, especially at sunset, no matter what the cloud situation is, I was nonetheless deflated by the clearing skies. The light was beautiful but the accent in the sky was absent. However, although the lackluster clouds had lessened the anticipated sunset, they had not done so elsewhere. To the north above Black Butte there were some beautiful clouds catching the light of the fading sun. Even more sublime was the staggering formations above Mount Eddy. The long clouds arced overhead, seeming to follow the dome of heaven’s contours. It was one of the most impressive Mount Eddy sunsets I have witnessed. Mount Shasta: awesome but disappointing nonetheless. 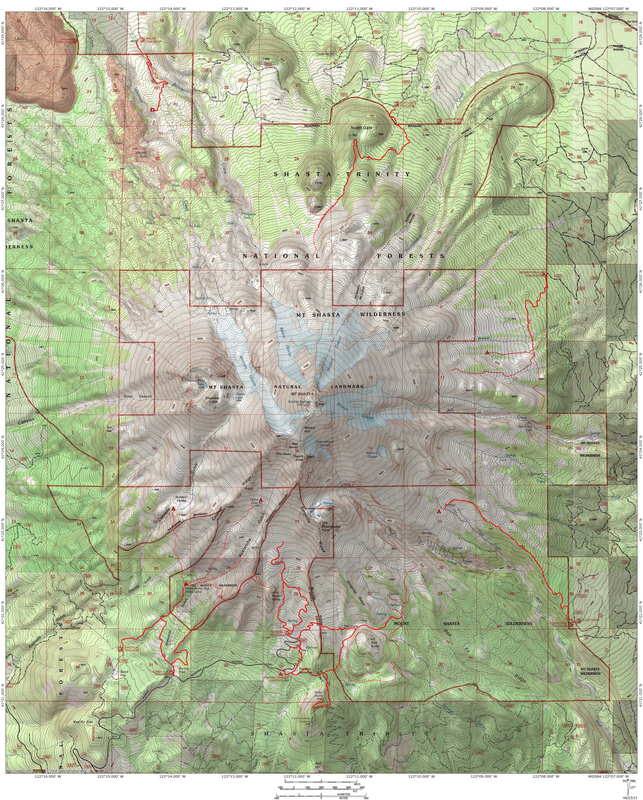 I was naturally disappointed such a special vision had not occurred over Mount Shasta but on further reflection, I reckoned it was right and appropriate for Mount Shasta to be lessened a bit and for its smaller siblings, Black Butte and Mount Eddy to receive their special due. As I have noted, they are overlooked and underrated, despite hiding in plain sight. The sunset over the mountain may have been dissappointing but the next morning was epic!